with a array of scarylicious goodies. around their neighborhoods as they says those famous words "Trick or Treat"
in hopes of receiving their favorite candies or other fun items. Let's take a look at what three lucky winners will each receive in this cool giveaway. 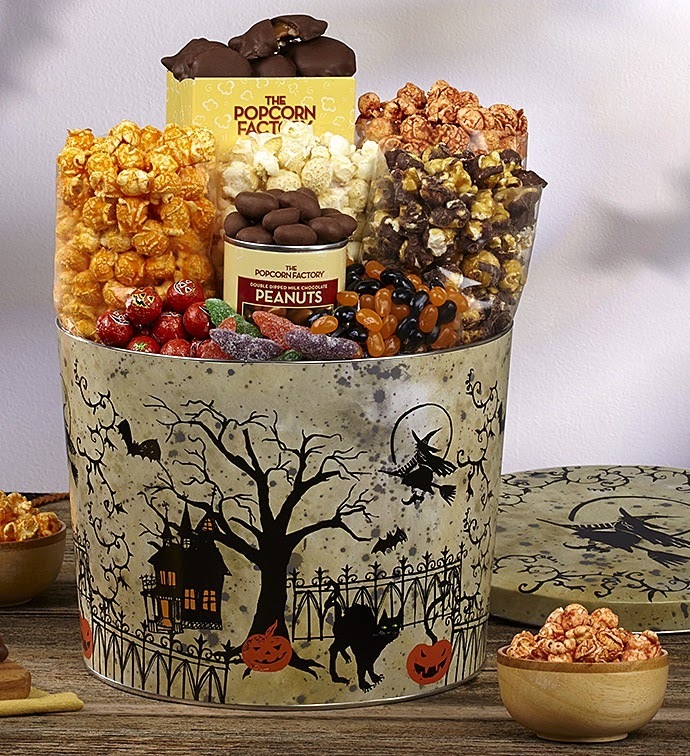 Their 2 gallon Fright Night Snack Assortment is packed with an array of scarylicious goodies: White Cheddar Popcorn, Jalapeno Popcorn, Cheese Popcorn, Drizzled Caramel Corn, Chocolate Covered Peanuts, Mini Pixies®, Halloween Jelly Belly® Mix, Sour Bats and Foil-wrapped Halloween Chocolates. Click Here To View The Complete Contents of each 2 Gallon Tin.